On October 10, 1920, the only unassisted triple play in World Series history was executed by Bill Wambsganss of the Cleveland Indians. In the fifth inning of Game 5 of the series against Brooklyn, Wambsganss caught a line drive hit by Clarence Mitchell, stepped on second base to get Paul Kilduff, and tagged Otto Miller, who was running towards second from first base. Wonderful picture. I noted the Cleveland black armband. 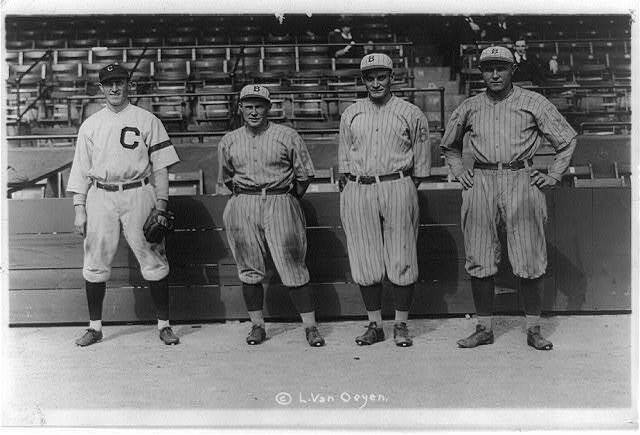 It took a minute, but then I remembered Ray Chapman was with Cleveland when he was killed by a pitch in 1920. Yes, it was! I had forgotten that was the same year. Thanks for the reminder. One has to wonder what Otto Miller was looking at — the play happened right in front of him. Maybe he suffers from Billy Butler/Titanic Syndrome, whereby it not only takes awhile to get up a good head of steam, it also takes awhile to stop. GO ROYALS! Haha, perhaps! Would be interesting to see if there’s any video of it, maybe it would show us something. Never seen one of those! Me either! Well, on replay during highlight shows, but that’s about it.